Welcome to the online exhibition of my photographic work! Since 2006, I have been travelling around on a rather frequent basis. Setting out for a trip, alone or with friends, I never parted with my camera and rest of photographic equipment, grabbing shots of mostly anything around. I created this site to share my images with friends and people interested in photography. The work herein depicts my style as a photographer and the way I see places, events and people through my camera. In the Portfolio section there are four galleries, namely Travel, Portrait, Panoramic and Vivid Photography. They contain some of my favourite pictures in relevant categories. In the Photo Exhibit section, I will be uploading recent (or not that recent) pictures of my travels or various events. To give some more insight into the photographic glimpses I am offering here, I can say that I have been taking photos on a serious basis since 2002. In 2007 I started cooperating on a freelance basis with various travel magazines. This cooperation gave me the opportunity to travel to destinations in Europe, Asia, Africa, USA, Australia and, of course, around Greece, doing extensive Travel/Reportage Photography. My work has been frequently published in high circulation Greek travel magazines and has also made it to front covers. Aside from that, I relish Portrait Photography (a big 'Thank You' to the friends who have patiently posed for me!). Artistic Photography also fascinates me, as can be seen in the Vivid Photography section of my Portfolio. And since a picture is worth a thousand words, I invite you to visit my photo galleries for more. 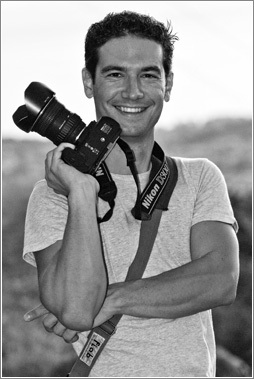 © Photo of me taken by Vassilis Petromelidis.